Why and how must you immediately begin preparations for the ICD-9 to ICD-10 conversion? Last year, the much debated ICD-9 to ICD-10 conversion deadline was delayed another year and set to October 1, 2015. However, numerous provider groups and stakeholders have been pushing for another delay, which would be the third in total, stating that the conversion will result in unmanageable financial pressure on the already challenged practices. This article summarizes how ICD-10 differs from ICD-9, what the Congress had to say about the deadline, and in what way must you prepare for the conversion. Last week, the Energy and Commerce Committee’s Subcommittee on Health held a public forum to discuss the ICD-10 deadline. The meeting panel comprised of experts and stakeholders from across the industry, and included doctors and EHR vendors. Despite opposition from a few stakeholders who held the view that small practices wouldn’t be able to manage the new codes, the majority voted in support of the October 1 deadline. Contact your EMR and Practice Management vendor and enquire your system’s readiness for the conversion. Ensure that their software possesses the necessary updates and ICD-9 to ICD-10 conversion mapping tools to make certain that your system is ready for, and will facilitate the conversion. In the case that your vendor is not ready, immediately begin looking for a new system. This is because from October 1, your claims will not be processed on ICD-9 codes. Delegate an ICD-10 expert (from you staff, or hire a professional) to train your staff, and to devise and execute plan for the conversion in line with your practice workflows. Consider Outsourcing Medical Billing if your ICD-10 expert (and yourself) feel that your current staff will not be able to manage claims processing on the new code set. Get in touch with payers and clearinghouses to determine their readiness. The target for completing these steps (apart from staff training which could be ongoing) should ideally be March 15. Next, you must begin internal testing of the new codes between March and April, to check how well your staff will manage the new codes. Ideally you should be done by this till the end of June at maximum; and make the necessary workflow adjustments to fix errors in which the process proceeds. After internal testing in June, you need to begin external testing with clearinghouses and payers to determine how well your test claims (with ICD-10 codes) will do once out of your practice. It is imperative to identify and correct any slow or disruptive processes in every stage of your conversion process. Doing so will enhance the efficiency of your practice, and help make certain that you are ready and equipped for the ICD-9 to ICD-10 conversion by October 1. The Affordable Care Act (ACA) enters the mature phase of its implementation, which is going to impact physician revenue in different ways – some favorable, others not much. Therefore, it is time for physicians to prepare for challenges ahead. Here are 5 ways that the ACA will impact your income in the years to come. According to the ACA, more services will be covered by insurances that were not covered previously. This step has gained immense support because “patients who have insurance and access to primary care have better health outcomes,” said Jeffrey Cain, MD, President of the American Academy of Family Physicians (AAFP). Now patients won’t have to pay from their pockets for medical services like blood pressure checkup, mammography, childhood and autism screenings, and contraception. More and more Americans will be insured in the years ahead and looking for primary and eventually specialty care. This means primary care practitioners can now enroll new patients bringing more money. However, most of these patients will come from low-income families, who will be insured on subsidized rates and pay out of pocket. Practitioners will be forced to rethink their patient payment policies because of changes in the ACA that will increase the trend of out-of-pocket charges. Kaiser Family Foundation found out in a survey that 72% of employees had a deductible for single coverage, which was 20% more from 2006. It further reported that annual deductible for 72% of employees was $1,097 in 2012, which was 88% higher since 2006. CMS incentive programs, Meaningful Use and Physician Quality Reporting System (PQRS), will reduce or stop payments from 2015. Meanwhile, physicians who haven’t complied with the programs will bear financial penalties. Accountable Care Organizations (ACOs) are a breath of fresh air for the physicians trying to decrease cost without compromising quality. This new payment model, pay-for-performance, was introduced to maximize the benefits for patients to improve quality of care while reducing costs. However, as the Model matures, physicians will be required to report their performance to CMS in order to participate in the shared savings. Adopting an Electronic Health Record (EHR) system is no longer an option, but an obligation. If your practice does not do so, you’ll be subject to penalties that will increase as time progresses. Additionally, you will be deprived of the incentive payments that many of your competitors are benefiting from. However, with several hundred EHR vendors to select from, you require an EHR pricing and vendor comparison to make the right decision. While the most important component of most decisions is price and costing, you still must develop an initial plan to determine which EHR vendor is appropriate including the how-much-will-it-cost-me component. First you need to limit the number of vendors on your option base. For doing so, you will first need to identify several vendors based on your personal knowledge, market research and on recommendations of other physicians. Look at the software and hardware their systems require. For example, a server-based system will require more hardware. Additionally, many of the leading vendors have EHR solutions that do not require installable software and can be accessed via internet. So first, you need to be sure of the solution you require. Once this comparison is done, you should narrow down your options by a more specific EHR software assessment. 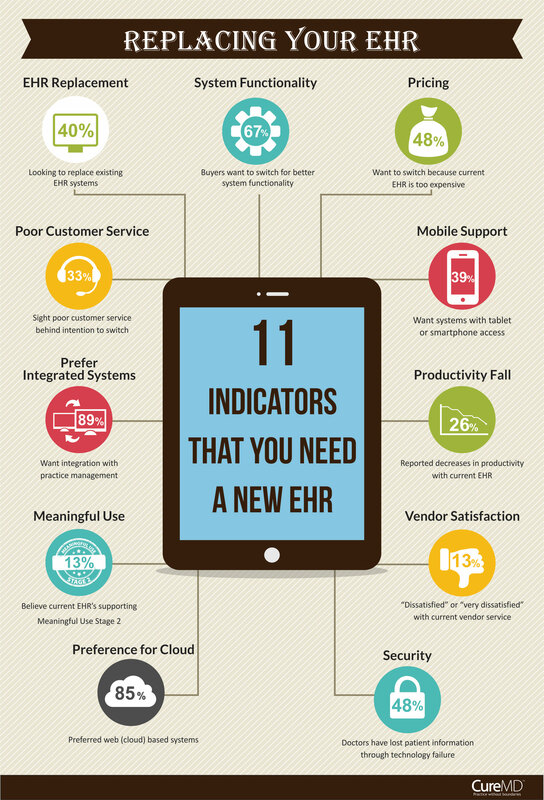 In this, you’ll analyze specific features that you require in your EHR. Which vendor is ready for ICD-10 and Meaningful Use Stage 2 certified, for example. Also do some research on other services offered by these vendors; common techniques for this are via rating and review websites, asking other healthcare professionals and by visiting the vendors’ websites. For example how efficient their customer service is and if they have integrated systems (if you require practice management solutions as well). Now with your options even more limited, conduct an EHR pricing comparison to determine which vendor has solutions that meet your budget. During this stage, include all costs such as those needed for the implementation, average staff training costs and any potential cost that you can think of.